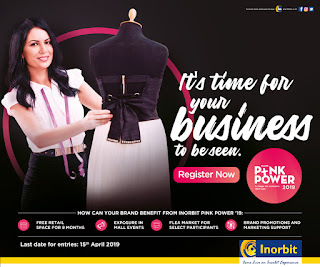 Mumbai, 8th March 2019 – On the occasion of International Women’s Day, Inorbit mall announced Season 5 of their annual marketing property – PINK POWER. As the name suggests, Pink Power aims to empower women entrepreneurs through this initiative by creating a business platform at Inorbit malls across all 5 geographies and enabling them to build their brand. Starting 8th March, women entrepreneurs are invited to submit their business ideas and embark on a successful journey. All they need to do is to submit their existing business plan, however big or small, by logging on to www.inorbit.in/pinkpower The online form allows one to choose categories like Apparel, Accessories, Footwear, Bags, Stationery (Gift Articles), Handicraft, Home Décor and Food & Beverage. Pink Power contest is open for women in Mumbai, Navi Mumbai, Bangalore, Hyderabad and Vadodara. The last day of the registration is 15th April 2019. Shortlisted participants will go through a series of rounds and will compete for the title. Winners will be given free retail kiosk space at the mall for a period of 9 months. That’s not all, they will also be provided marketing support by Inorbit throughout the period of the kiosk to give their brand visibility. Mall will also enable them to participate in various In Mall events. Over the last four seasons, Pink Power has emerged as one of the most loved campaigns amongst women entrepreneurs. Inorbit Mall is excited about its 5th season of Pink Power and is hoping for a great participation.